3'x5' polyester flag with white header and two grommets. Flags have two rows of stitches on the fly and two rows on the top, bottom, and header side. Image is screen printed and appears on both sides. 3'x5' polyester flag with white header and two grommets. Flags have four rows of stitches on the fly and two rows on the top, bottom, and header side. Image is screen printed and appears on both sides. Novelty version of the Irish flag. 3'x5' polyester flag with white header and two grommets. Flags have two rows of stitches on the fly and two rows on the top, bottom, and header side. Image is screen printed and appears on both sides. 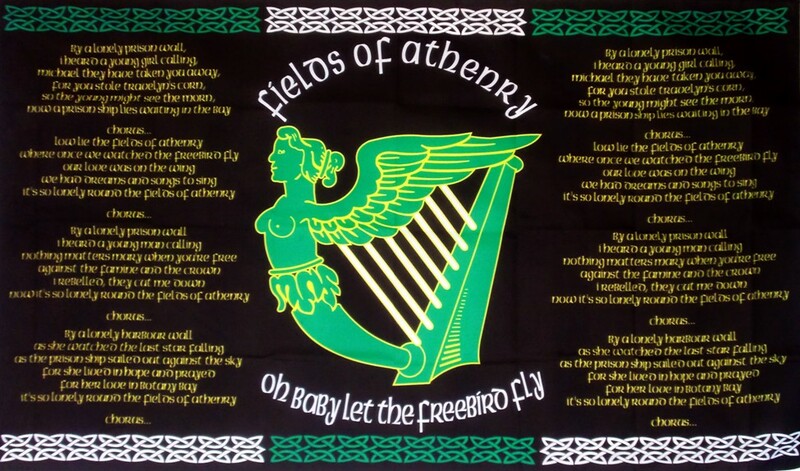 The Irish Soldiers Song. 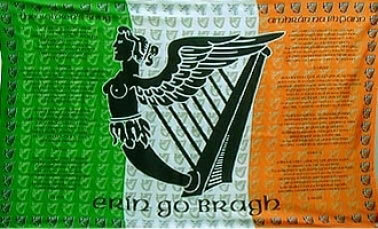 Based on the American "Erin Go Bragh" flag. Celtic Nations flag. Featuring the flags of Ireland, Scotland, Wales, Isle of Mann, Cornwall, Brittany, and Galicia. 3'x5' polyester flag with white header and two grommets. Most flags have four rows of stitches on the fly and two rows on the top, bottom, and header side. Image is screen printed and appears on both sides. Celtic Nations flag. Featuring the flags of Ireland, Scotland, Wales, Isle of Mann, Cornwall, and Brittany. 3'x5' polyester flag with white header and two grommets. The image is screen printed and appears on both sides.